Originally scheduled for February 13th. Slides can be viewed below. 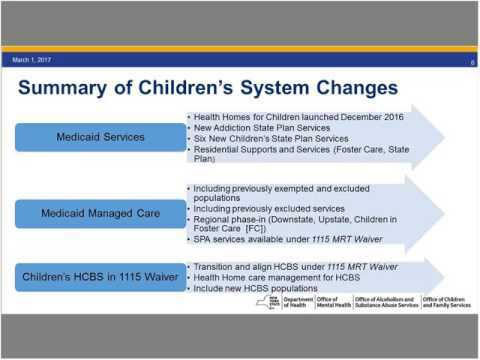 State representatives from NYS OMH, OASAS, DOH, and OCFS provided an overview of the draft 1115 MRT Waiver Demonstration for Children. This 1115 is in the public comment period with a feedback submission deadline of March 15th. State presenters​ reviewed the draft 1115 MRT Waiver Demonstration for Children, provided clarification, and offered insights​ into this complex technical document. There was a significant portion of time allotted for Q&A.